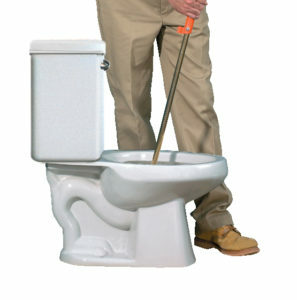 Closet augers are the ideal tools for clearing clogged toilets. 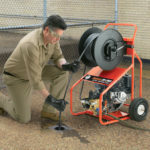 And General’s closet augers are the most durable in the industry. Patented double layer Flexicore® cables resist kinking and breaking yet offer the right flexibility. Read on to learn more about our three foot auger 1 m or telescoping six foot auger 2 m to clear stoppages just beyond the bowl. The tough outer steel tube is 3/4” in diameter. Inside, a galvanized steel rod turns the cable. Other features include a vinyl bowl guard, vinyl grip handle and turning handle, and a “Grip Clip” for securing the cable. The heavy-duty six foot Teletube Closet Auger 2 m (Cat # T6FL) lets you clear stoppages just beyond the bowl. No need to lift the bowl, because the Teletube has an extra three feet 1 m telescoped inside a guide tube until you need it. After you’ve worked the first three feet into the bowl, you can go three feet farther simply by pressing a button and pulling the crank handle. The outer steel tube is a big 1-1/8” in diameter. 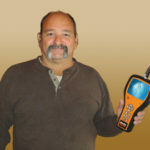 The hexagonal guide tube is even tougher than the steel rod we use in our 3FL closet augers. The Teletube weighs just a little more than a 3FL too. Other features include a vinyl bowl guard, vinyl grip handle and turning handle, and a “Grip Clip” for securing the cable. Shows hexagonal guide tube. You just press the button, pull back on the handle and you’ve released more feet of cable. 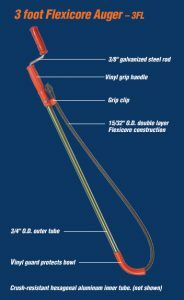 Both the three foot and the 1 m Telescoping six foot 2 m closet augers feature patented Flexicore wire rope center cables. 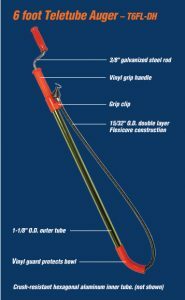 Flexicore cable is made from two layers of tempered spring wire wrapped tightly around a 49-strand wire rope center. 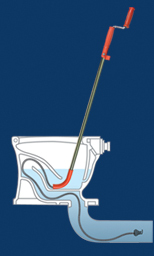 It resists kinking and breaking yet has the right flexibility to go through low flow toilets. It’s so tough, it’s guaranteed for a full year. Both augers offer the optional flexible down head to make it easier for the snake to follow bowl contours. The down head springs through sharply angled passages while protecting the inner walls from chipping and breaking. 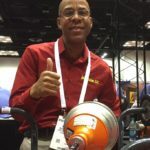 Have you ever had to carry a messy, wet closet auger through an upscale office or hospital corridor? While a garbage bag will do, it just doesn’t look professional. General’s Closet Auger Bag keeps the closet auger contained and out of sight as it’s carried to and from the job. This durable bag features a wide mouth end with a heavy duty zipper so the closet auger easily slides in. Three vent holes allow the auger to dry between jobs. And a thick shoulder strap keeps your hands free to carry the rest of your tools to the job.